Getting back into normal life is weird. Time has been simply flying by, and all of a sudden, we are about to hit a three-month anniversary. Wait, the wedding was already three months ago? Yikes. The biggest thing we have focused on has been getting the condo back into working condition. The wedding prep months had this place looking a bit cray-cray, and we hadn't eaten a proper meal at the dining room table since the winter. A little organizing here and there later, and now we have everything back to it's normal (clean and organized!) state. This OCD gal couldn't be happier. It's been nice having friends and family over again. Our first big purchase as newlyweds was an easy one. Living in a condo leaves us with limited storage space. We have had to be clever with what we have so far, utilizing a big IKEA bookcase for books and display in the living room, and racks in our patio closet to store out of season items. What has been lacking, though, has been somewhere for our nicer dishes and growing bar service wear. 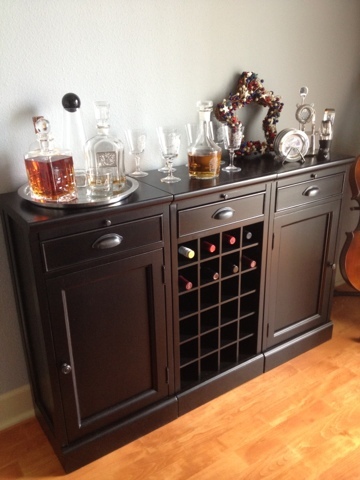 A new sideboard/bar was in high order. Enter our new bar! 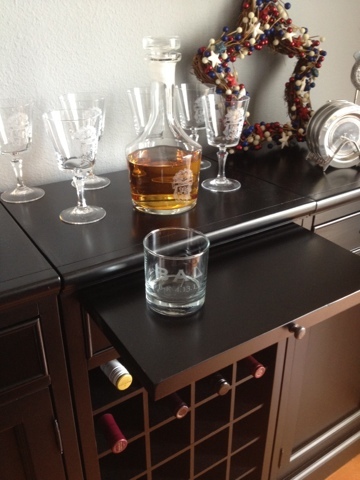 We picked this one from Pottery Barn it because it provided space for wine while adding tons of surface and cabinet space. I absolutely love it. Our china has a proper home, and we can have a "bar cart" style table top, too. 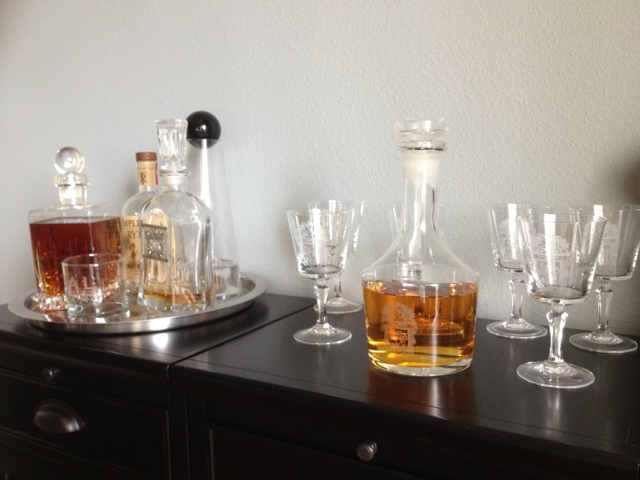 It's wonderful to have a place to display our collection of decanters and Lehmann family crest-adorned crystal glassware. I especially love the pull-out trays that provide space for drink prep, and the drawers that can hold bottle openers and other accessories. My mom gave me this hint for storing china. I didn't want to box it up and put it away, never to be used. Along with nice dinner parties and fancy occasions, we like using ours for date nights at home. She recommended that I use simple coffee filters to separate the plates, keeping everything safe while right at hand for easy use. Genius, and only $2 for the pack, instead of way more for fancy liners. Great idea, Mom! Have you done any space upgrades recently? Tell me about them!